Front admins have access to manage their team members' preferences, signatures, and team inbox permissions. This allows you to standardize certain settings like a default reply channel or canned response shortcuts for everyone on your team. 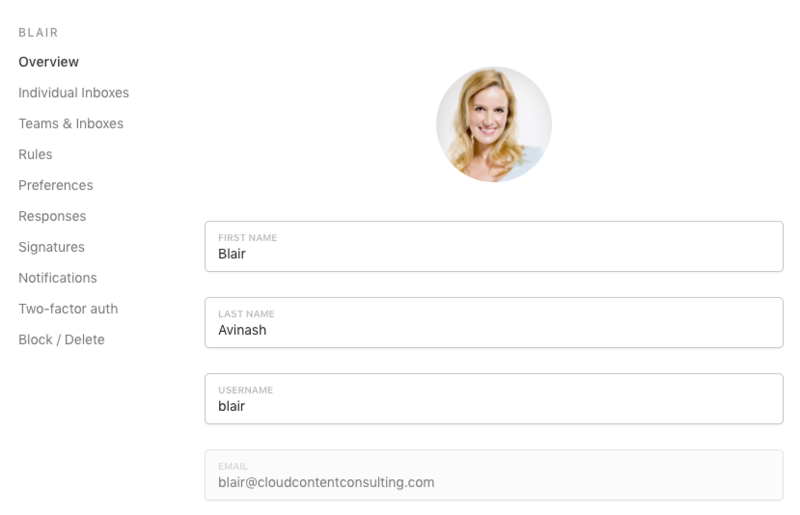 You can easily configure settings for new team members or update them along the way, without requiring them to learn and edit each one themselves. Click on your avatar and into Settings. Under the Company section, click Teammates. Choose the teammate from the list to see a menu of settings for this user. Click into each category and make any necessary changes. Be sure to click Save for each category where you make changes. See the section below for details on each category. What settings can admins manage? 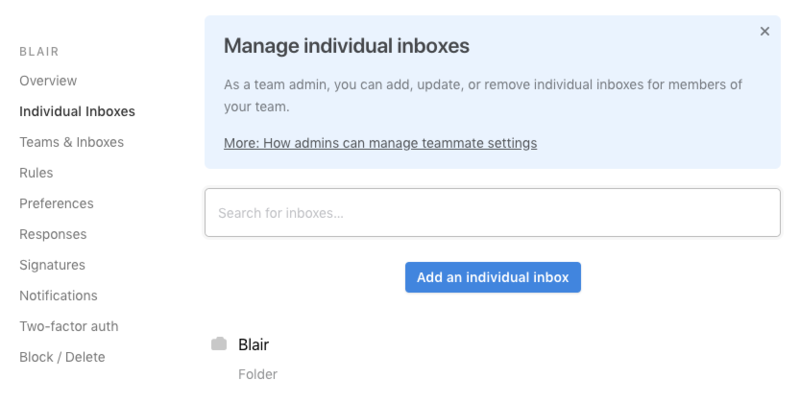 You can set up an individual inbox for the teammate in this section. The process to add the inbox is the same as adding any inbox into Front; you can choose the channel type and walk through the setup screens. The only difference here is that you will not have the ability to give access to other teammates, or yourself, for the private inbox. Only the inbox owner will be granted visibility for the inbox and they can choose to share it with others once they log in. This section will allow you to grant access to team inboxes. If you are on a plan with Teams, you can choose which Teams they belong to and set their role for each Team. 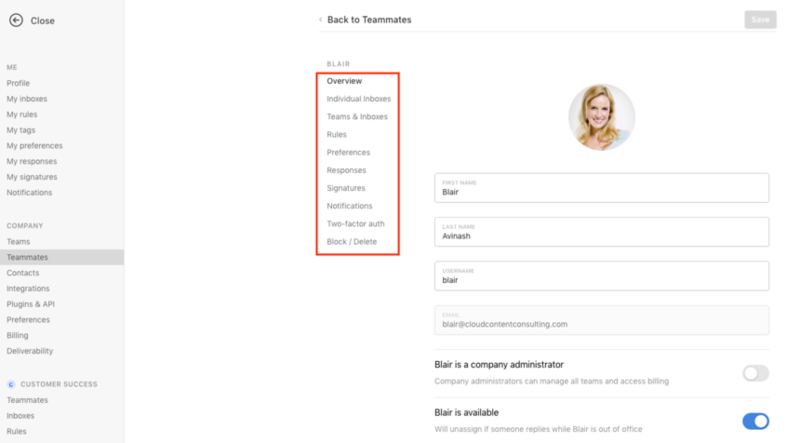 The default roles you will see are Team Member and Team Admin and any custom roles you've created. Users can have different roles on different teams. You can create individual rules for the teammate in the Rules section. As a reminder, these individual rules will apply to their individual inbox(es) and not to any team inboxes. 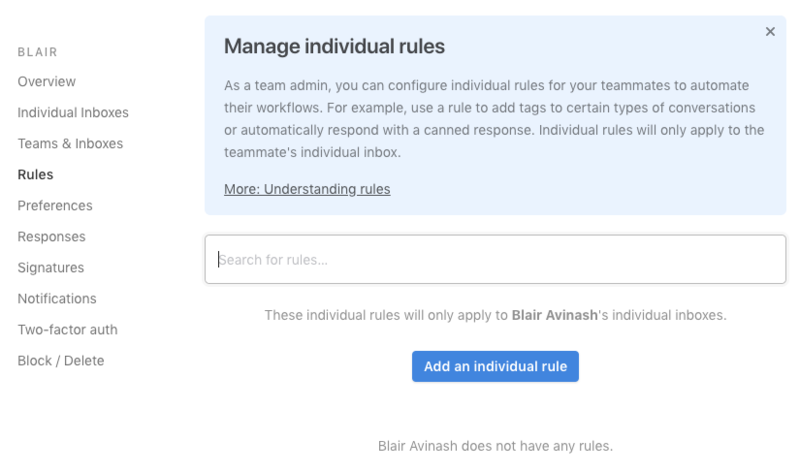 Adding rules here enables you to set up any automated workflows your team uses correctly, without needing each teammate to learn to use the rule engine. The Preferences category houses the same list of personal preferences that you have when you access your own My preferences. You can use this to ensure that everyone on your team has the same set of behaviors in Front. 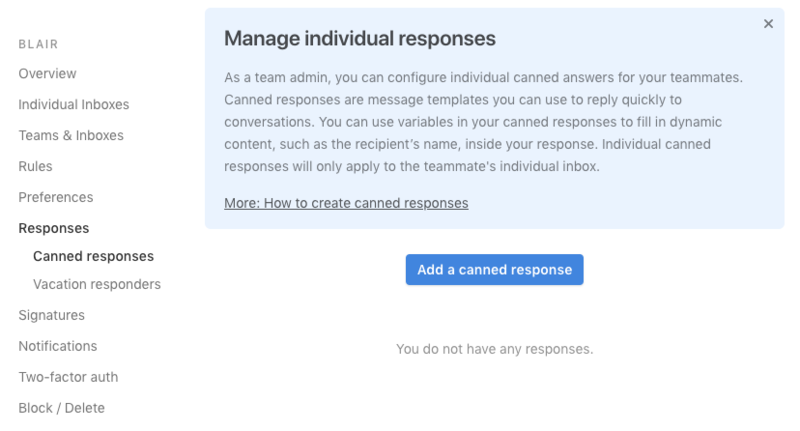 In the Responses category, you can create and edit both Canned responses, and Vacation responders (for which you can turn on the date range during which it should send) for the teammate. 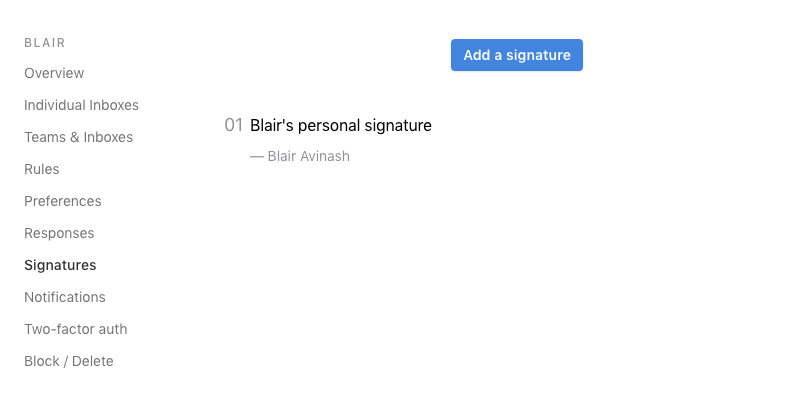 In the Signatures section, you can create and edit personal signatures for the user. Click on Add a signature to create a new one, or click an existing signature to edit it. This feature is helpful if you'd like all teammates to have a certain text format, logo, or link in their signature. You can also standardize signatures with team signatures under the Team section in Settings. Just like with your own notifications settings, you can set your teammate's Notifications for them, both Basic notifications and Advanced notification rules. 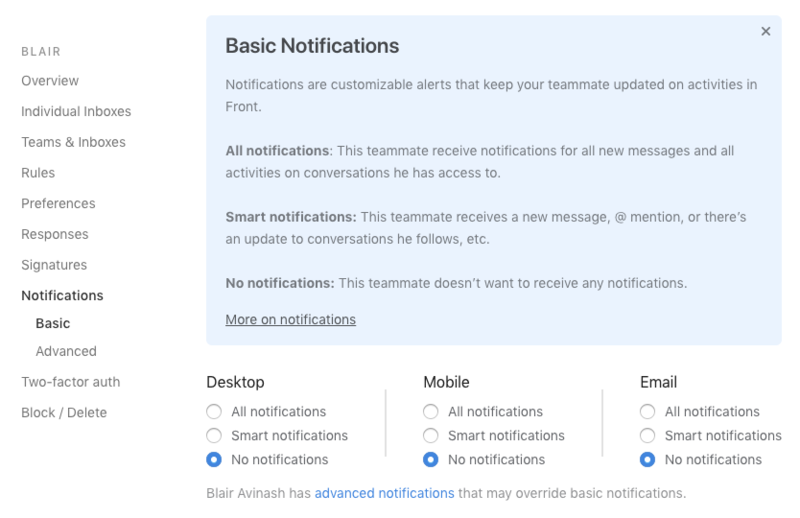 This is very helpful to standardize what notifications teammates should be getting to ensure they do not miss an important message. When a teammate has set up two-factor authentication, you can disable it here if they lose their authentication method and cannot log into Front. Toggle off the setting and input your password to confirm the disabling. Note: The teammate will need to use their own account to set up their two-factor authentication. 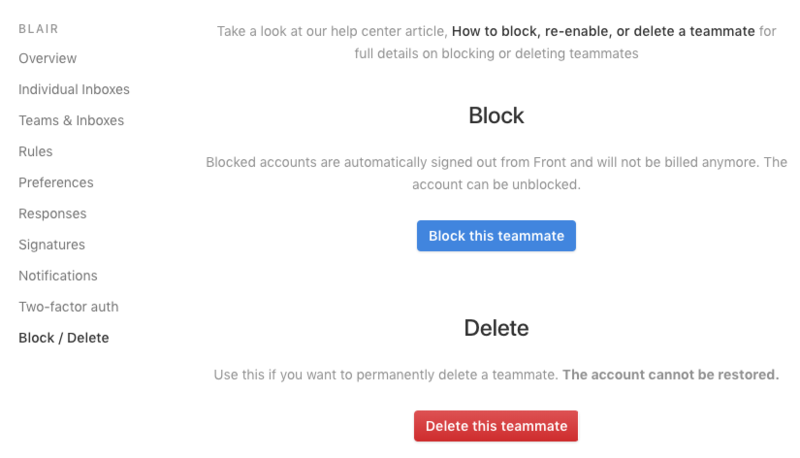 This section allows you to block or delete the teammate. Blocking a teammate will keep the history and activities of their account intact, but stop them from logging in and you will not be billed. Deleting a teammate will delete the teammate from your Front instance and cannot be restored. You will still be able to see the activities they were part of.